Hassan Hanafi during a lecture that he delivered in Beirut. Al-Waki' Al-Arabi Arrahin (The Current Arab Reality), By: Hassan Hanafi, Cairo: Al-Ain Publishing house, 2012, 2 Vols. 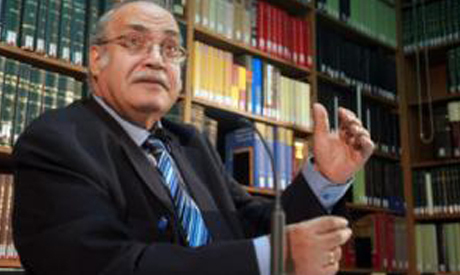 Renowned Egyptian philosopher, Hassan Hanafi, has just released a two-volume book titled The Current Arab Reality, from Al-Ain Publishing house. The book is a testimony of the Arab world issues and the situation that preceded the eruption of the Tunisian and Egyptian revolutions, and with it the Arab Spring. Within six chapters, the first volume tackles the issues of Egypt, Palestine and Arabs. The second volume contains chapters on the national culture, religion and politics with the last chapter dedicated to the West. Through "life experience" methodology, Hanafi’s book attempts to analyse and explore the Egyptian revolution and the aftermath in the Arab world. The works of Hassan Hanafi, the 77-year-old Egyptian thinker and emeritus Islamic Philosophy professor at Cairo University, are mainly in the field of Islamic philosophy. He’s best known for his intellectual project that carries the same name of his most famous book, Heritage and Modernisation. He sparked a considerable controversy among the Egyptian academics when he launched what he called the “Islamic Left,” where he tried to reconcile Islam with leftist thought. He is also known for his book Introduction to theScience of Occidentalism, where he tries to exercise a reverse kind Orientalism. Hanafi argues that Arabs never really understood nor questioned the West.